Having fallen foul of the flu this week I have been pondering what I would write. Whilst the head is still a little foggy I thought it best to look at something that I managed to do with my daughter in a couple of days as a gift for her cousin. It is not an expensive thing to do, making a gift for someone, it is something very special, with time and love spent in making it. The commercialised side of Christmas has really taken hold. I would say for most people it is a case of what is the latest gadget that I can get, what piece of technology is there out there that I don’t have. The one that leaps to mind for me is the IPhone. My son has told me that I don’t need an IPhone as I only need a basic mobile, I would never use all the other bits and pieces attached. He’s probably right! Anyway, I move off the subject. 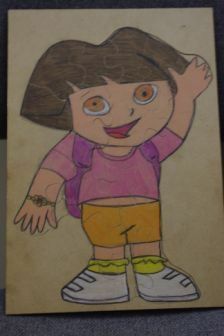 I drew my daughter a picture onto a piece of wood, coloured it in and then cut it into a puzzle for her. Yes you need to know how to do this sort of thing, but there are many gifts to be made. Without prompting she wanted to know if she could make one too, for her cousin we are going to visit at Christmas. She is 4 and I looked at her and said of course, thinking that I would end up doing all the work. How wrong was I, she helped search the internet for pictures of a tractor (her cousin is into tractors), then I drew it onto her board, and she coloured it in. Not the idea I had. Her cousin is going to get a brightly coloured tractor puzzle that she spent 2 days making. How much more special can you get (photo here). So on a somewhat shortish note, think about the latest gadget you’re thinking of getting. How much love and thought is there in this? I love my gadgets and toys that I have, and yes it is great to have an excuse like Christmas to go and ‘upgrade’ again. At the same time though, isn’t it nice to have that little something special, the thing that says I really thought about you at this special time of the year. 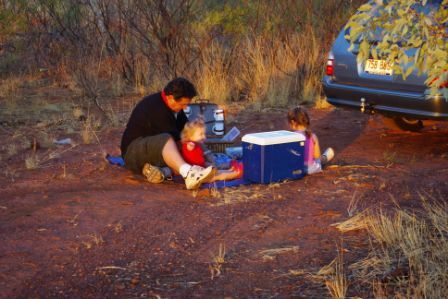 Someone else, the wonderful Wonderkarin, asked me why not in the whole of Australia? I joked a bit, then amended it to ‘the whole world,’ but I’ve been thinking about it since and thought it might be nice to post about it. I adore my kids, and they’re pretty special. Apart from the ongoing sleep issue, they really are adorable, special, cute, wonderful, happy and loving. There’s some normal toddler bickering, and big girl really doesn’t get that other people have a say too. But she works so hard at listening and loves her little sister so much and is so caring that it’s easy to overlook. And she’s just turned 4 for goodness’ sake! Some of it’s luck, the whole genes/environment and personality thing. Some of it’s circumstance – they have two parents who love them and can give them anything they need and a stable, nurturing environment. Some of it is hard work on their part, especially big girl. But I’ll also put my hand up to say some of it has been hard work on my part. I’ll go against all the cultural conditioning that says I should be modest and say I’m really proud of the job I’ve done so far and I hope I can continue to do as well. But they’re not the best kids in the world. There isn’t really any such thing. What I consider traits to cherish and nurture, someone else will consider bad manners. What I consider minor annoyances or just being a little kid, someone else will consider mortifying. And there will definitely be lots of people who think baby girl’s sleep (or lack thereof) disqualify her straight away. We all have different values we want to pass on to our kids. Which makes the whole competetive mothering thing absolutely pointless, doesn’t it. Why would I compare my kids to someone else’s when I don’t want kids like theirs? I don’t mean that in a bad way, just that I will guarantee that we have different priorities of what we want our kids to be like. And that’s the other reason I don’t like saying my kids are the best in the world – I’m not competing with anyone and I don’t want to. My kids are the most gorgeous, caring, kind, smartest, funniest, cuddliest, cheekiest, most confident, curious and just plain fun kids in this house. They always will be, and that’s all they need to be. Are yours? It’s not actually possible for your head to explode. You may want it to, but that’s another story. I’m ridiculously in love with my big girl. She has been so worried about me being sick and she’s been adorable, cleaning, playing with her little sister and a pleasure to be around. The little one can sleep for 5 hours straight. Several other nights there’s been a lot of crying, but that one gives us hope. I’ve never had sinusitis before. I thought I had, but a dull ache above and below the eyes is nothing to the drill/knife/jackhammer that’s been active this week. My entire eye socket and even my teeth hurt. There are actually about 15 trains a day from Rome to Venice, but for some reason I can’t get tickets after the 12th of December. Later ones had better become available in the next couple of weeks. There is a Charlie and Lola live show in London on the 23rd of December. My girls are going to LOVE it. I’ve worked out how to put together a yoked jacket with a lined hood and bodice with minimal instructions. Now I just need time to finish the hems and buttons and for baby girl to actually try it on. It’s ok to let something go. I always over-commit myself ridiculously and stepping back from something has changed my stress levels enormously. There is a local woman who does clothing alterations/repairs who put a new zip in my favourite jeans. Now I just need to lose the weight so they’re comfortable again. It’s much less painful if you don’t look at everything as you sort it. Two big boxes of baby clothes ready to go to playgroup and be passed on. I should have left the corn on the cob for both girls. They ended up hijacking ours and we ate the kernels I’d cut off for them. I love my husband. He’s helping deal with baby girl at night, doing his normal job and painting our new investment property after work. And he’s been looking after me while I was sick. Between 1 and 2 is such a happy, loving, exciting, adventurous age. 1. Played in the paddling pool – with warm water! 2. Pretended they were puppy dogs – fetching balls and bringing them back in their mouths. 3. Did the grocery shopping, sans underwear for baby girl because it took so long to get ready I forgot she’d taken them off. 4. Attempted to get baby girl to sleep while big girl was strapped in the highchair (her choice) with extra food and the remote control. 5. Got up to deal with big girl being stuck, gave up on bed and ended up getting baby girl to nap in my arms. 6. Big girl whispered ‘Fox in Socks’ to me and I did the long pages. 7. Collected and filled a million water bottles while both girls ferried them to the fridge and poked them in any gaps they could find. 8. Cooked chocolate cupcakes and decorated them with bright pink icing and sprinkles. 9. Sang nursery rhymes on my bed. 11. Chopped up chicken while big girl put it in the egg and flour and told me how much she loved having chicken for tea. 12. Counted each mouthful of salad for big girl and coaxed her to eat one tiny piece of chicken because she doesn’t like it. 13. Got out 50 pieces of ice because big girl ran into a pole while trying to sneak up on Daddy and split her lip and baby girl decided that sucking on ice sounded pretty good. Ok before anyone says this is really twee, I’d like to point out that my kids choose their own clothes and hairstyles. If given the chance they pick mine as well, and think that’s even better. Wordless Wednesday – Look Mummy! A goat!